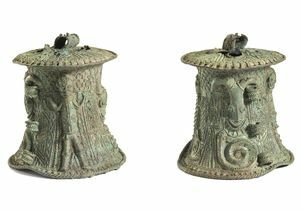 Front and back views of a copper-alloy bell from southern Nigeria embellished with figures including a human figure, rams, a crocodile, a coiled snake and a tortoise. “Summoning the Ancestors,” the new exhibition at the Fowler Museum at UCLA, explores a comprehensive collection of bronzes — 76 bells and 73 ǫfǫ (small objects derived from wooden staffs of power) — produced in abundance in southern Nigeria by Igala, Igbo, Edo and Yorùbá peoples. 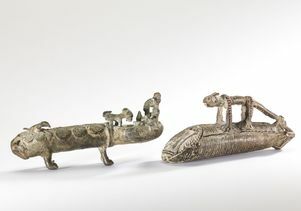 Dating from the 15th to mid-20th centuries, these little-studied works may be related to metalsmithing traditions associated with the famed sculptures found at the archaeological sites of Igbo-Ukwu, Ife and the Benin Kingdom. Grouped together by style as opposed to geographic area or maker, the installation highlights the potential of a large collection to demonstrate variations of style and decoration within a particular genre. Staged upon a multilevel platform running the length of the Fowler in Focus Gallery, the bells include examples big and small, richly adorned or spare in profile, and some that stretch ideas of what a bell can be. Many appear in multiples, standing like kindred souls, one next to the other; others represent unique forms. Metalsmiths use the lost-wax casting technique to create these forms, produced with copper alloys of bronze (copper mixed with tin, lead and trace elements) or brass (copper mixed with zinc and small amounts of other elements). The convention in Nigerian art studies is to apply the generic term “bronzes” for all copper alloy objects. Artist-smiths went to great lengths to individualize the pieces, applying their own stylistic signature to each one through a wide array of raised and incised patterns, including spirals, loops and dots, as well as floral and animal motifs. 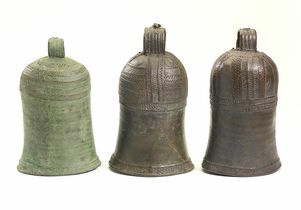 Many of the bronze bells on view were rung to invoke ancestors or nature spirits. Some announced the presence of important members of the living world, such as priests or local rulers. When worn on the body, a bell’s sounds might protect the wearer from malicious influences. The frequent inclusion of bells on shrines and in rituals, dances and burials underlines a pervasive belief in the efficacy of this instrument. 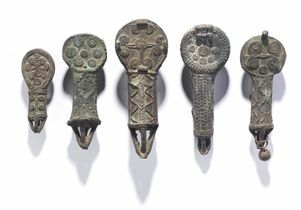 The use of bronze ǫfǫ, which represent a person’s prestige, seniority and personal integrity, dates back to at least the 15th century. Ǫfǫ are kept in shrines and only held in the owners’ hand while swearing oaths or offering prayers. The ǫfǫ is a dynamic symbol of one’s independent relationship with the ancestors and one’s moral authority within the family unit and social group. In form, ǫfǫ likely derive from wire-wrapped bundles of ǫfǫ tree twigs (Detarium senegalense) found at shrines. Isoko, Urhobo, Igbo and Ijo peoples living in the Niger Delta and riverain areas venerate this tree, viewing it as central to ancestral service and political power. Sacred wooden objects are often copied in bronze to enhance their power and prestige. Across the ages, these cast bronze objects were perceived to possess a unique capacity to communicate, not only with its their immediate human audience but also with other, unseen worlds. This collection, a promised gift of Mark Clayton, offers an opportunity to explore this and other untold stories while paying homage to the imagination of artistic metalsmiths forgotten. “Summoning the Ancestors” is organized by the Fowler Museum at UCLA and is guest curated by Nancy Neaher Maas, independent scholar, and Philip Peek, professor emeritus of anthropology, Drew University, New Jersey. 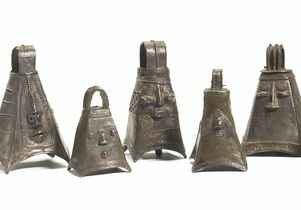 Gallery Talk: Cast-metal bells from Nigeria are full of secrets that belie their simple forms. How were they made? By whom? Who owned them and for what purposes? 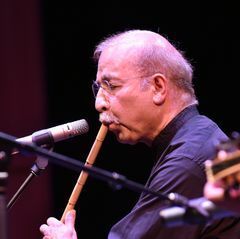 Were they always used as sounding instruments or for something else? Guest co-curator Nancy Neaher Maas explores these mysteries and more. Culture Fix: Guest co-curator Philip Peek explores the small cast bronze ǫfǫ in “Summoning the Ancestors,” which stand for an adult Igbo man’s personal integrity and moral authority, and link him to his ancestors. 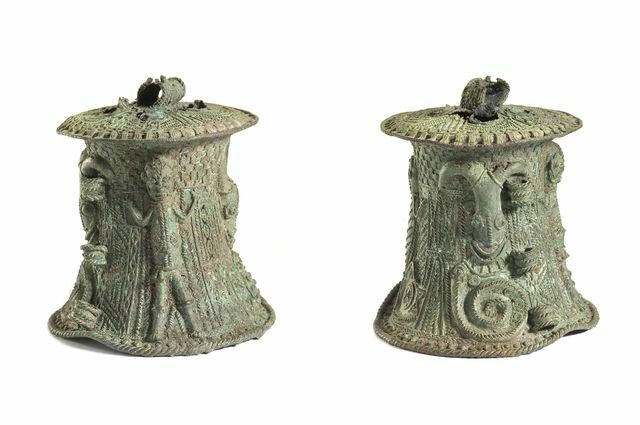 Used in rituals and kept on shrines, mystery surrounds the makers of these delicate and highly ornamented personal bronzes. More information about events at the Fowler Museum. Photo Don Cole/Fowler Museum at UCLA.